paper 0-8101-1640-5 The Loss ($44.95; $14.95; Aug.; 136 pp. ; 0-8101-1639-1; paper 0-8101-1640-5): More fiction from the prizewinning Russian author of Escape Hatch and Baize-Colored Table with Decanter. The title novella, about its obsessive protagonist whose efforts to dig a tunnel beneath the Ural River earn him eventual canonization, wheezes with conventional and predictable ironies—as does “Klycharov and Alimushkin,” a fable-like tale of its title characters’ crisscrossing and conflicting destinies. Far better is “The Prisoner from the Caucasus,” a spare and direct story (made into an acclaimed recent film) detailing the relationship between a Russian soldier and his Chechen captive. 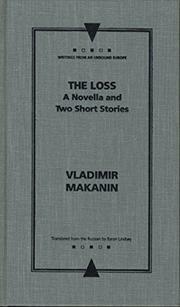 It’s the least tricky and mannered, and most affecting example of Makanin’s seemingly overpraised work to have reached English translation thus far.